The best Golden Globes hosts come in twos, as proven by Amy Poehler and Tina Fey from 2013 to 2015. 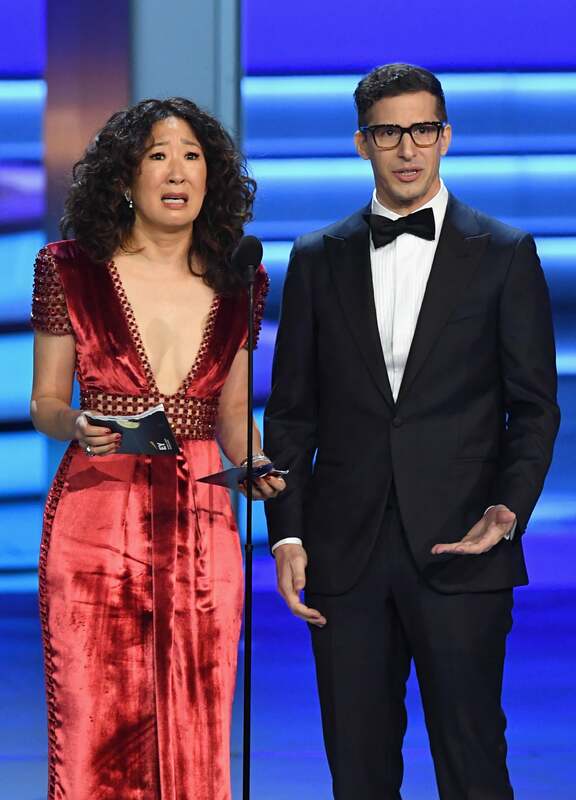 Now, the Hollywood Foreign Press Association is doubling down on a new duo, having tapped Globe winners and "best friends" Andy Samberg and Sandra Oh to bring their infectious charm and indelible humor to the 2019 Golden Globes! Since nabbing their coveted hosting gig, it’s hard to see the duo's presentation at last year’s Emmy Awards as anything other than a stellar audition. The Grey's Anatomy and Saturday Night Live alums marched onstage to present the Outstanding Directing for a Comedy Series Emmy and quickly stole the show. First, Oh tore the winner’s envelope in half. "I was in the moment!" she exclaimed. "I got overwhelmed!" Then, she decided the winner would be whomever came to mind, including La La Land ("No! Don't say that. Anything but that!" Samberg cried) and Jeremy Park (a guy she supposedly dated in high school). Clearly, this impressed the HFPA. To really trace Oh's undeniable magnetism, fans have to look back to her Golden Globes win 12 years ago, where she claimed to feel as though “someone set her on fire” as she accepted the Globe for Best Supporting Actress in a TV Drama. "Thank you for writing this," she told Shonda Rhimes. "And thank you for letting me act." She then hilariously admitted to forgetting everyone else's names -- but no one really seemed to mind! Samberg proved long ago that he has what it takes to be both hilarious and memorable (in a good way) at the Guys Choice Awards, where he used his time accepting his "Primetime Award" to get a little raunchy. "When the good people at the Guys Choice Awards sat down and decided to invent this award out of thin air, I like to think they had only three questions in mind to pick a recipient,” he said. “One, who is in town and available? Two, who is technically on a TV show? And, three, does this person have a wang? And in the end, two out of three ain't bad." He also took the time to share that all the women in attendance looked like they were in "agony" wearing skin-tight get-ups and guessed that a lot of the female attendees likely needed to, ahem, pass some gas. "If you are talking to me at any point tonight and you need to fart, I’m cool with it," he told the audience. "I can be your fart home base. I'm married, so it's not weird." Samberg was tapped to play ringleader at the Emmys four years ago, where he offered up loads of priceless gags. However, the best had to be his opening song, in which he playfully pretended to have locked himself in a bunker to watch every TV show on the air, making him the ideal candidate for the gig. Of course, this devotion to television meant missing out on a year of his life, when his son (played by Billy Eichner) turned into a man. Will Forte also dropped by as a version of Les Miserables’ Inspector Javert to imprison Samberg for watching too much TV, until he's reminded that watching too much TV is not a crime against humanity. “Images are extremely important to culture, and being a part of that image-making, I take a great responsibility and I'm very grateful for my job to be able to do so. I hope that the wave continues and we see real change," she told ET at the time. "We can talk about how long it is, but change does take a long time, so the more that we talk about it, the more that we have opportunities to be in front of an audience, to say, 'Hey, we're a part of culture too.'" 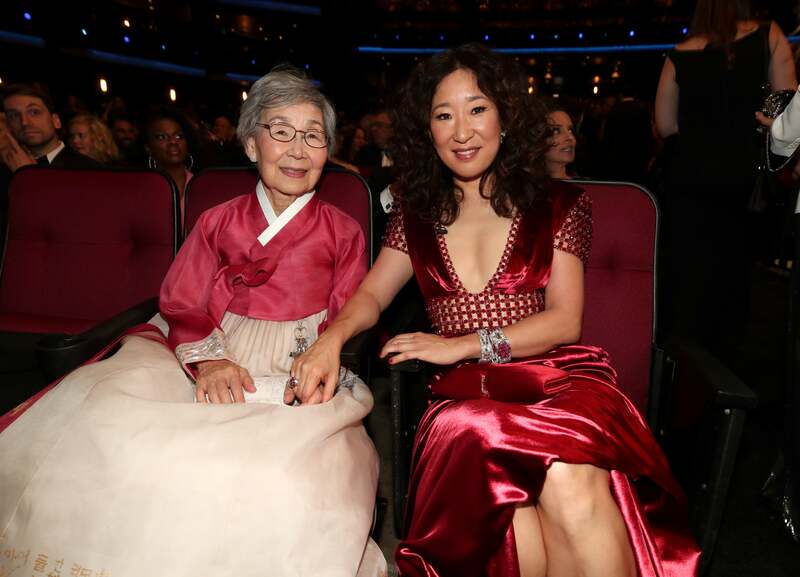 Oh adorably brought her mother, Young-Nam Oh, and father, Joon-Soo Oh, along with her to the show and though she ultimately didn't win the Emmy, Claire Foy (who did) announced from the stage, "This wasn't supposed to happen. Sandra Oh, I just love ya." Although examples of Samberg's comedic chops at awards shows are copious, the best example of what fans can expect to see at this year's Globes has to be his rousing musical number at last year's Film Independent Spirit Awards. He took the stage dressed as John Bender, Judd Nelson's rebellious character in The Breakfast Club, where he sang a special rendition of the Simple Minds classic, "Don’t You Forget About Me." In lieu of an In Memoriam segment, Samberg sang about actors like Timothée Chalamet and Kumail Nanjiani "passing on" from their indie roots when they've become too successful, which was all incredibly amusing. Samberg's continued insistence that he actually is Judd Nelson was equally memorable. To see what Oh and Samberg have in store for us at the 76th Golden Globes, tune in on Jan. 6 at 5 p.m. PT on NBC.